A kitchen or bathroom remodel requires more than just cabinetry. Kitchens and bathrooms involve, electricians, plumbers, and installations of many products. To a home owner, this quickly becomes a very overwhelming undertaking, especially if done without the knowledge of a licensed subcontractor. One of the first steps in a kitchen renovation is getting the plumbing in order especially if moving the sink to a different location or adding another one. What better way to ease the stress of a kitchen or bathroom renovation than to gain insight from an industry professional. Dominic Calello of Calello Plumbing provides his advice when looking to hire a licensed contractor. Dominic has a story about a very eager flipper who hired an unlicensed individual to make all plumbing repairs. He spent thousands of dollars on what ended up being a poor plumbing job and an eventual disaster for a prospective homeowner. 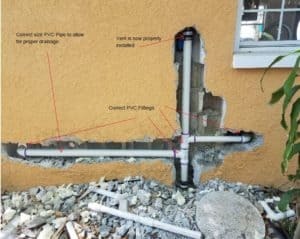 Among the overall faulty job, the unlicensed individual reinstalled rusted piping, used undersized, wrong fittings, and used PVC glue on CPVC water piping. These incorrect “fixes” would have caused a flood if not corrected soon and had caused a boat load of problems for the eager flipper because he did not hire a licensed and insured professional. It is illegal in the state of Florida to hire an unlicensed contractor of any kind. A good starting point is to ask anyone you trust if they know of anyone in the field you are shopping. If someone you trust knows of someone it can be a great starting point. Whether someone is recommended to you or you find someone through other means, it is important to check them out. Second, make sure they are insured. You should always ask for proof of insurance. Whether it’s a project or a repair, you should always have an agreement in writing. Having something in writing will allow you to see exactly what you are getting and help minimize any potential misunderstandings about the work being performed. There is a basic rule when it comes to the trades in general and it lands somewhere between no down payment up to 50% down. This is generally determined by the size and timeline of any given project or repair and at the discretion of the company. If you are having a larger or time consuming project done, you should expect to pay a down payment.